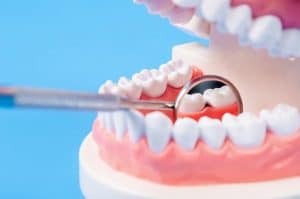 Because everyone’s oral health is unique, your specific risks for things like periodontal (gum) disease may be different than others. However, the main cause of the disease itself is the excessive buildup of harmful oral bacteria underneath your gums. Therefore, preventing or treating gum disease at our Encinitas/San Diego periodontal office typically involves eliminating the threat of oral bacteria by carefully removing them and protecting your gums from their influence. Gingivitis, the infection in your gums that results when oral bacteria first accumulate under them, is the first prominent warning sign that you’re at risk of gum disease. It occurs when plaque and tartar buildup on your teeth roots, and is marked by redness, inflammation, and sometimes, bleeding in your gums. In many cases, gingivitis can be treated with deep cleaning, or scaling and root planing, which involves gently removing plaque and tartar buildup from your teeth roots. Once the bacteria are gone, your gums can heal and reattach themselves to the roots. While scaling and root planing helps you directly remove plaque and tartar, we may also recommend options for neutralizing oral bacteria and inhibiting their future buildup. For example, many harmful oral bacteria are anaerobic, meaning they thrive without oxygen. Through ozone therapy, we can introduce safe, concentrated oxygen to provide a minimally invasive way for combating gum disease-causing bacteria. In combination with regular preventive care and consistently good hygiene at home, ozone therapy can help significantly reduce your risks of developing gum disease. In addition to ozone therapy, we may recommend a daily treatment plan of Perio Protect, an antibacterial solution that actively neutralizes harmful oral bacteria. Perio Protect is a topical treatment that you can apply every day at home with the help of custom-designed mouth trays. The trays help you apply the solution evenly, and are made from biocompatible acrylic for optimal comfort. Perio Protect may help you reduce or eliminate many of the uncomfortable symptoms of gingivitis, including unchecked inflammation in your gums. Harmful oral bacteria are the building blocks of gum disease, and your fight to maintain your healthy smile is largely with them. For more information about minimally invasive ways to fight gum disease-causing bacteria, schedule a consultation with Dr. Kania by calling her periodontal office in Encinitas/San Diego, CA, at (760) 642-0711.